Investigators examined the role of serum homocysteine, folate, and vitamin B12 levels in patients with vitiligo. More specific therapies designed to target the pathways involved in vitiligo may offer better results. 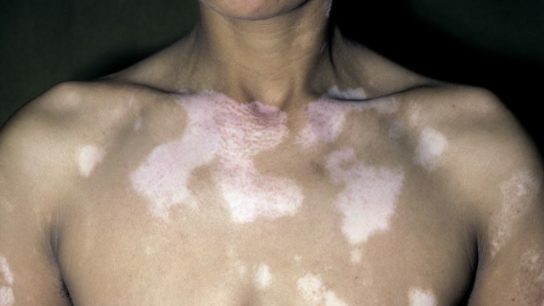 Narrow-band ultraviolet B is a common therapy for vitiligo, and in nonsegmental vitiligo covering at least 20% of the body surface, it is the first-line treatment. 5-fluorouracil achieved a higher percentage of repigmentation versus tacrolimus. Systemic autoimmunity can affect the progress of a pregnancy, causing maternal complications and adverse fetal outcomes.